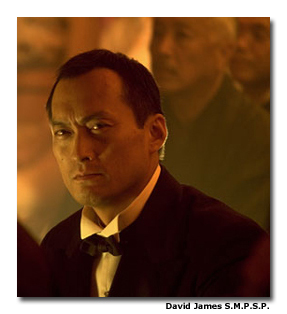 Several years ago, few people outside of Japan had heard of Ken Watanabe. But when he walks into a swank Beverly Hills restaurant for breakfast now, people know who he is. True, they may not recognize the tall, lanky film star in his black sunglasses and casual clothes, but mention The Last Samurai (2003) or the recently released Memoirs of a Geisha and heads immediately nod with approval. Watanabe’s stunning portrayal of the dignified samurai leader Katsumoto in The Last Samurai earned him an Academy Award nomination and the respect of a worldwide audience. Although it was Watanabe’s first English-speaking role, the 47-year-old actor held his own opposite Tom Cruise, who played Nathan Algren, a disillusioned American soldier who is brought to Japan to train their armies. When Algren is captured by Katsumoto’s warriors, the American is drawn into the ways of the samurai. He develops a friendship with Katsumoto, one that cannot be severed, even in death. Watanabe’s portrayal of Katsumoto in The Last Samurai earned him an Academy Award nomination. That friendship extended from film into real life. Cruise and Watanabe became good friends while working on Samurai, cracking jokes and even singing together on the set. Yet it was the quiet moments between the two characters that showed Watanabe’s true talent. His stunning portrayal of the serene leader aptly demonstrated Katsumoto’s inner strength. “I liked everything about the role I played in The Last Samurai,” Watanabe says. “It was one of the first Hollywood movies that portrayed Japanese culture in a true light. They put a lot of effort into reflecting the spiritual values that are part of Japanese society. The film reflects Bushido, a code of ethics that emphasizes being respectful of elders, keeping promises and being honest.” That code of ethics, Watanabe believes, can still be found in Japanese society today. 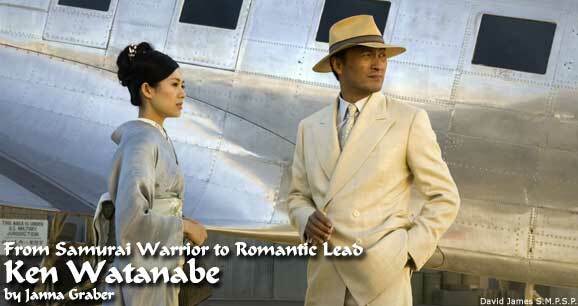 Since breaking into Hollywood with Samurai, Watanabe has been hard at work on new films. He appeared as Ra Al Ghul, an immortal criminal genius, in Batman Begins (2005). But it is Watanabe’s role in the new film Memoirs of a Geisha that has the critics talking. In this movie adaptation of Arthur Golden’s bestseller, a penniless Japanese girl is ripped from her home to work as a maid in a geisha house. Despite hardship, the young women blossoms to become the legendary geisha Sayuri (Ziyi Zhang). Though Sayuri has almost everything she wants, she is haunted by her secret love for the Chairman, a man she cannot have (Ken Watanabe). The film has an impressive cast of top Asian actors, including Ziyi Zhang (Crouching Tiger, Hidden Dragon, 2000), Gong Li (Raise The Red Lantern, 1991), Michelle Yeoh (Crouching Tiger, Hidden Dragon, 2000), Koji Yakusho (Shall We Dance?, 2004) and Youki Kudoh (Snow Falling on Cedars, 1999). The film has brought increased interest in Japanese culture, especially in the geisha lifestyle. Geisha are professional entertainers who perform the Japanese arts; the profession is entirely voluntary. Authentic geisha are still seen today in the Gion District of Kyoto, one of the most traditional regions of Japan. Watanabe has come a long way from the boy who grew up in the coastal region of Niigata, where he enjoyed skiing with his older brother, Jun. Both of his parents were teachers — his mother teaching primary school and his father calligraphy — and music was an important part of Watanabe’s life. Watanabe eventually joined En, a Japanese theater company, then made his television debut in 1982 with Michinaru Hanran (Unknown Rebellion). From there it was only a matter of time before he became a household name in Japan. The experience changed the actor in other ways, too. He is careful about what he eats, and relishes every opportunity in life, not wanting to waste a single day. Yet it’s obvious that Watanabe enjoys his work. “I want to be an actor who is flexible and can work anywhere in the world,” he says. No doubt he will do just that. Interested in learning more about Japanese culture and the geisha lifestyle? Kintetsu International Travel Consultants, offers a geisha tour program to celebrate the movie Memoirs of a Geisha. 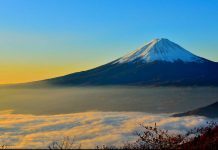 The two-day program, along with the seven-day package, introduces visitors to Kyoto and the daily rituals of geishas living and working in Kyoto. For details, call KIE at 800-422-3481 or visit www.japanforyou.com. The Hotel Granvia Kyoto is now offering guests the opportunity to spend an evening at a traditional teahouse, or ochaya, in the Miyagawa-cho district of Kyoto. Here, guests will not only be welcomed into a world of traditional Japan rarely seen by outsiders, but they will also enjoy an elegant Kyoto-style kaiseki dinner with entertainment provided by geisha. For further information, please visit the Hotel Granvia Kyoto website.